Velvet Inspiration: Pattern Suggestions Please? As part of Indie Pattern Month, The Monthly Stitch and Dresses & Me are running a contest to help one of you launch your own indie pattern brand through Project Indie. We’re super passionate about indie designers – we love seeing all the ideas and creativity out there, and supporting emerging businesses. Here at The Monthly Stitch, we’re running Indie Pattern Month every June, to celebrate all the amazing indie pattern labels that are out there and encourage you all to try out a new indie label or two. Over at Dresses & Me, Penny is dedicated to stocking only indie designers, helping them to get their patterns to other corners of the world and helping all of us get our hands on their designs a bit more easily. It seemed a natural step to us to collaborate to help support new labels with getting off the ground and getting their designs out there for us all to enjoy. And so, Project Indie was born! We thought long and hard about what to offer the winner. Since Project Indie is all about helping another indie label get started, we’ve pooled our knowledge and resources, and gotten a couple of other people on board to share their skills and knowledge as well, to put together a sort of support kit. Helping with some of the details of getting started – pattern testing, proof reading, logo design (if you don’t already have one), publicity, selling your pattern (via the Dresses & Me store), mentoring from a well-known indie designer (Kristiann from Victory Patterns), and helping make sure your website design is easy for customers to use and matches your brand. There will be people on hand with experience in graphic design, web design, usability, marketing, pattern testing, and kick-starting an indie label. And we’re all keen to share our knowledge and skills to help get your label off the ground! So, what do you need to do to enter Project Indie? Well, first things first – you need to design and draft a pattern for a garment for an adult women. Then you need to take that pattern and grade it, so it covers a size range of at least four sizes. You’ll also need to digitise it – put it into a PDF format so people can print it out on their home printers. And you’ll need some instructions too, so people know how to stitch it up. Once you’ve got your pattern, you’ll need to get some photos of the finished garment on a real, live human being, so we can see what it looks like made up. You’ll also need some line art for it, so we can see the pattern’s lines. And of course, you’ll need a description and a name for it, too, so we (and your future customers!) can read about it and know what to call it. Since it’s not just a pattern that we’re helping you to launch, but an entire indie label, you’ll also need a name for your label, and to have given some thought about what your label is about. What’s your design aesthetic? Who’s your target market? Bundle all that up, and send it in to us by the end of July 2014, to enter the Project Indie contest! However, since Project Indie is all about helping someone launch a new indie label, you can’t have had a pattern published for profit before (however, if you’ve released a free pattern, you can still enter). Now, you may be wondering, how will we decide the winner? The winner will be chosen based on two areas – how popular the pattern idea is, and how well executed the judges thing the pattern idea is. We’ll figure out how popular a pattern is by putting all the Project Indie submissions up on The Monthly Stitch for everyone to vote for their favourite. The rest will be assessed by a panel of judges (The Monthly Stitch editors (Kat, Mel and Juliet), Penny from Dresses & Me, and Kristiann from Victory Patterns). Then we’ll combine the scores from both areas to find out who won! We’re going to be looking for a few things. Creativity, execution, and a strong business idea. Execution covers a couple of areas. How well done is your PDF? Does it print nicely, does the layout make sense? What about the instructions – are they easy to read and to follow? Does the line art and the description give us a good sense of what the pattern is for? Can we clearly see what it looks like made up and worn? And as for a strong business idea? What we’re looking for here is how well you know what direction you want to take. Have you given much thought about what your label is all about? About the designs you want to make in the future? About how you’d describe your label to other people? Ok, I can do all that. How do I put in my entry for Project Indie? Submissions must be emailed to themonthlystitch@gmail.com by the end of 31 July 2014. Instructions (in English, however if you want to translate them into other languages as well go for it) for sewing up your design. Again, these need to be in a format that can be easily downloaded and printed on an at-home printer. Line drawings of what your garment looks like. Make these look good and make sure they include the style lines – they’ll be what people use to help them decide whether they want to buy your pattern or not. Images of your design, sewn up and modeled by a real human being. These images are what will attract your future customers to your design. Want some ideas of what makes a good photo of a finished garment? Have a look at some of your favourite indie labels and see what they’ve done. A description about your label – what is your design aesthetic? Who is your target market? What’s your label all about? Yay! It’s June and that means it’s Indie Pattern Month and I can finally tell you about Project Indie. 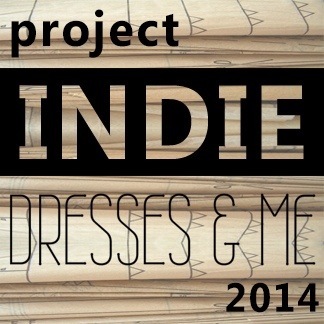 Dresses & Me in collaboration with the Monthly Stitch is excited to announce the launch of Project Indie – a competition to find the next big name in indie patterns. And the prize? Our expertise and encouragement to help you succeed and the winning pattern will we sold in Dresses & Me pattern store. So what are we really looking for? Ultimately, a designer who is orginal, creative and has a business mind. Perhaps you have some great ideas but you need a confidence boost to encourage you to launch your range? Or maybe you’ve got your first pattern together but don’t have your own blog and aren’t sure how to publicise your new pattern? That’s where we come in. Pattern testing and proof-reading by experienced sewists. We will also give honest and helpful feedback. Contacts with well-known bloggers who will help publicise your new pattern. A sewalong hosted on the Monthly Stitch blog. You can write the posts or if you’d prefer we can help you there. Help designing a logo for your brand and a customer review of your website. Most importantly, your submission must be an original design. You can’t have had a pattern published for profit before, however, if you’ve released a free pattern, you can still enter. You must include instructions (in English), photos of you (or another person) modelling it and line drawings of your design. Your pattern must be graded to a minimum of four sizes. You can choose which size range. You’ll need to think of a memorable name for your pattern and your brand. Your pattern must be in a format that’s easy for home sewists to download and print. The competition is now open! Submissions must be emailed to themonthlystitch@gmail.com by the 31 July 2014. The winner will be announced in August. Will you be entering?! The judging panel consists of Penny, Mel, Kat, Juliet and Kristiann.